All three branches of government—executive, legislative, and judicial—come together at the Inauguration. The chief justice of the U.S. Supreme Court administers the Oath of Office at the U.S. Capitol, where Congress meets. Both major political parties are involved in planning the event. The following resources provide extensive content for actively engaging young people in presidential inaugurations and history. Our White House Inauguration Celebration Kit for Kids! Trigger your student’s interest in the presidency by digging into this all-in-one resource containing exclusive articles, activities, games, and discussion questions you can use at home, in the classroom, and at community meetings. Why Are Presidential Inaugurations Held on January 20th? Presidents need time between the election and their inauguration to organize their cabinet and make plans for their government—but not too much time. The Twentieth Amendment ushered in a swifter transition. The words “I do solemnly swear” are known to every American. 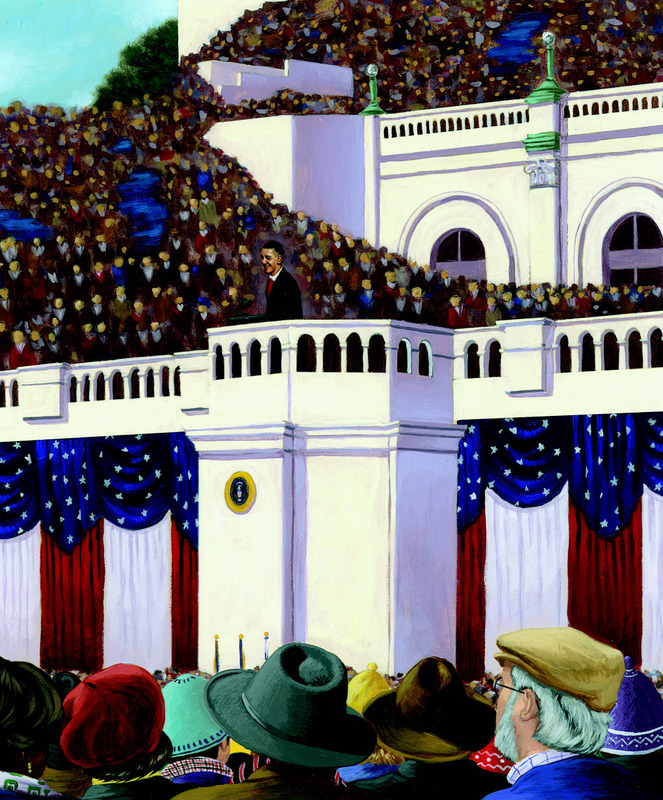 Discover the history of the presidential oath of office and its accompanying ceremony. From the moment Washington journeyed from his home at Mount Vernon escorted by enthusiastic supporters to his inauguration, the American people have honored their new presidents with festive parades. Thomas Jefferson’s inaugural address was delivered in “so low a tone that few heard it,” but the volume of the day proved explosive otherwise. The lack of social media did not prevent throngs of Americans from attending George Washington’s inauguration, but today’s technology does enable citizens who are unable to travel to Washington, D.C. the ability to witness history in the making from afar. Spark your students’ creative energy and utilize their thinking caps as you share these fun projects and discussion topics for understanding and engaging in presidential inaugurations past and present. A collection of selective online inauguration resources that provide research opportunities and lesson plans. OUR WHITE HOUSE. Illustration © 2008 by A. G. Ford. Reproduced by permission of the publisher, Candlewick Press, Somerville, MA.